Congressman Ed Markey in Second Life, chairing the House Subcommittee on Telecommunications. 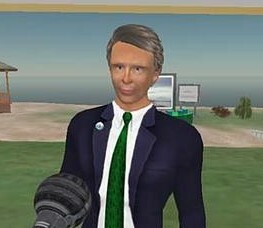 When Congressman Ed Markey, the Democratic representative from Massachusetts, wasn’t able to make it to the Bali Climate Summit last December, he did what an increasing number of corporate leaders were already doing: he created a Second Life avatar and attended via the virtual world. Markey was so impressed with his experience that he declared, “It won’t be my last.” True to his word, he recently returned to Second Life, this time in the company of his fellow congressmen. When the House Subcommittee on Telecommunications opened April 1 to investigate public safety issues involving virtual worlds, Markey, with the help of Linden Lab, IBM, and a non-profit technology firm, was able to preside over both the real-world chambers and the duplicate, virtual chambers. He was joined in-world by a couple of fellow congressmen, and a handful of Second Life residents who gathered to observe the proceedings. By means of screens set up in both chambers, avatars and flesh-and-bloods were able to see and communicate with each other across the two ‘verses. As an added bonus, comments by the avatars were visible at the bottom of the real-world screens (“There’s another softball question”). It was Markey’s avatar who pounded the gavel and officially opened the meeting. After a time, however, the committee got down to the business of investigating the security issues posed by virtual worlds, most especially those involving terrorism. It wasn’t all terrorists and money laundering, however. The committee also explored the possibility of pedophiles exploiting Second Life for their own purposes. Rosedale, said that he takes “child protection very seriously,” and that Teen Second Life (for kids 13 to 17) bars adults. Furthermore, as with chat rooms and other social networks, he was quite sure that more than a few avatars were created by police and other agents to keep an eye on such illegal actions. “Once a sexual predator gets into a virtual world, how are you going to find him?” asked Rep. Bart Stupak, D-Mich., a former state trooper. Rosedale defended Second Life saying that it uses credit card and telephone information for age verification and has actively involved the FBI in investigations. 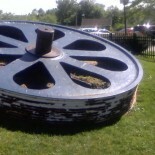 While acknowledging that there was “only so much you can do,” he added teens are encouraged to “actively identify and warn us about anyone’s language and behavior that might suggest they’re not teenagers.” This “vigorous self-policing by the residents” was confirmed by Larry Johnson, CEO of the New Media Consortium. But despite all the talk about virtual terrorists staging in-world jihads and the presence of observers with wings, antlers and morphing capabilities (one avatar turned into a bee towards the end of the hearing), the most surreal moment was actually supplied by John Shimkus, the Republican representative from Illinois. Shimkus became annoyed at the suggestion that the United States was not keeping up with Europe in its broadband penetration. Those European cars must be awfully fast.